Beyond the Question "Burkini Yes, Burkini No"
In summer 2016 the ‘burkini debate’ exploded not only in France, but also in other Western countries. Although France’s highest administrative court suspended the ban on the use of burkini, several towns in the French Riviera have continued to keep this ban in place. As stated by the ruling of the municipality of Cannes, the first city applying this prohibition: “Beachwear that ostentatiously displays religious affiliation, when France and places of worship are currently the target of terrorist attacks, is liable to create risks of disrupting public order”. 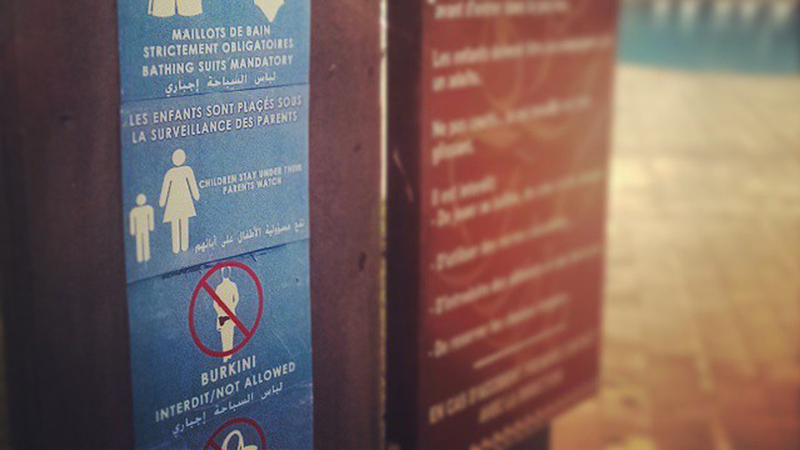 But what is exactly the burkini? Why has it created such controversial discussions? The burkini is a type of women swimsuit that covers the whole body except the face, the hands and the feet, according to the code of modest dress within Islamic traditions. In reality, it is not a new idea and it has not been originated in Europe: in the early 2000s the burkini was crafted in Australia by a Lebanese-Australian designer, Aheda Zanetti, who decided to adapt the Islamic veil with the Australian lifestyle. In a few years, it has successfully become a swimwear brand and has received official approvals from the Islamic community in order to encourage women’s participation in sports. The current discourse in France is based on two main issues: firstly, the burkini has been described as “a symbol of the enslavement of women” (referring to the French Prime Minister Manuel Valls’s declaration), secondly such a ban can be explained with the approaching French presidential election next year and the increase of fear and hatred towards Muslim people after a series of terrorist attacks in the country. Nevertheless, on the contrary, this has created new divisions and controversies in France’s relationship whit its Muslim population, one of the largest in Europe. Also within the feminist context, the debate has been rather tense. In particular, most of historic feminists have defined the burkini as an archaic garment with the aim of hiding the women’s bodies and of being an imposition from the Muslim community. In wider terms, the core issue is to understand the complex relationship among religious standpoints, democratic societies and secularism. If it is necessary to regulate cases of violations of basic rights, on the other hand it is impossible to impose such rules in order to supposedly guarantee freedom and equality. Such a question is still more problematic in relation to women belonging to the most marginalised communities, and especially to Muslim women. France continues to fail to understand such an essential premise that, if taken seriously into consideration, would improve its policy towards minorities. What are in fact the results of the immigrant integration process in France? What about the increasing inequalities, divisions and the resulting development of ghettos in the major cities of France? The ‘burkini’ debate is only one among many other examples of the questionable policy France is adopting regarding its internal problems in the light of the worldwide struggle against terrorism. It is time that the principles of “liberté, egalité, fraternité” become effective and include all citizens, along with their diversities.